The gloves are off: Usually, Indian industry praises the government in public and saves its grievances for closed-door meetings. In that sense, the World Economic Forum's India Economic Summit this year was unusual, and not just because it was held in Mumbai for the first time. Reliance Industries Chairman Mukesh Ambani, seen on the left with Commerce Minister Anand Sharma (centre) and ICICI Bank chief Chanda Kochhar, led a clamour of voices calling for more decisive action by policymakers, while the government responded with a list of things it has done. Carrefour, Walmart and their ilk have something to look forward to this Christmas. The government appears poised to allow foreign direct investment, or FDI, in multi-brand retail, perhaps with riders on job creation and protection of small enterprises. A draft note by the Commerce and Industry Ministry, following the recommendations of the Committee of Secretaries, seeks to allow 51 per cent FDI in multi-brand retail and remove the limit altogether for single-brand retail, which is now capped at 51 per cent. It seems Coca-Cola, thrown out of the country by the Janata Party government in 1977, has finally put the trauma behind it. The company has decided to invest $2 billion more in India over the next five years. That is as much as the amount it has already brought in since re-entering the country in 1993. In social networking lingo, it is +1 for the banking sector. State Bank of India, the country's largest lender, beat analyst estimates with a 12.4 per cent rise in net profit to Rs 2,810 crore for the quarter-ended September 30. The net non-performing assets, or NPAs, rose marginally to 2.04 per cent from 1.70 per cent. Competitors ICICI Bank and HDFC Bank, too, posted higher than expected increases in net profit of 22 per cent and 32 per cent respectively. And it is -1 for aviation. It is not just Kingfisher Airlines which is in the red, so is Jet Airways, which had losses of Rs 714 crore in the second quarter, and SpiceJet, which reported a loss of Rs 240 crore. Trouble in the skies, indeed. Network 18 CEO Haresh Chawla has resigned from the company. Chawla oversaw the growth of the company from a single business news channel, CNBC-TV18, and solitary portal, Moneycontrol.com, with revenues of Rs 15 crore in 1999, to a diversified media group with revenues in excess of Rs 2,500 crore. Tata Steel reported an 89 per cent drop in second quarter group profit as foreign exchange losses and higher raw material costs dragged its earnings down. Net profit fell to Rs 212 crore in the second quarter from Rs 1,980 crore during the same period last year. It was not much better elsewhere in the group. Tata Motors, the other jewel in Tata's crown, reported a 16 per cent drop in consolidated net profit - including Jaguar Land Rover's - to Rs 1,877 crore. Another vehicle maker Mahindra & Mahindra's standalone profit was down two per cent at Rs 737 crore. Major economies are heading for a slowdown, according to the Organisation for Economic Cooperation and Development. Its composite leading indicator for members hit its lowest reading since December 2009. In September, it fell for the seventh straight month to 100.4, slipping from 100.9 in August. Eurozone worries continue to keep policymakers and the public awake at nights. Greece's new Prime Minister Lucas Papademos, a former European Central Bank Vice President, said the only way Greece could head in the right direction was by staying inside the Eurozone. The immediate priority is to secure the payment of an â‚¬8 billion loan instalment before the middle of December. In a march of the technocrats, former European Commissioner Mario Monti was nominated Italy's next Prime Minister, in place of the colourful Silvio Berlusconi, to lead the country out of its debt crisis. When Greece and Rome are burning, can fellow ancient civilisation India be fiddling? The alarm bells here are less shrill, but they can be heard all right. 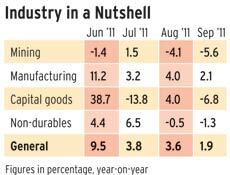 The industrial output growth slowed to 1.9 per cent in September. Inflation, at 9.73 per cent in October, continues to be the bugbear of policymakers, staying above nine per cent for the 11th month in a row. India's gross domestic product, or GDP, grew 7.7 per cent in April to June, the slowest in six quarters. The rupee continued to weaken against the dollar, registering its lowest level in 32 months. Oil companies have cut petrol prices ahead of the winter session of Parliament. After adjusting for state taxes, petrol will be cheaper by Rs 2.22 per litre in Delhi, Rs 2.34 in Mumbai, Rs 2.31 in Kolkata and Rs 2.35 in Chennai. We are also likely to see adjustments every fortnight. But is the petrol price truly decontrolled? The government has approved amendments to the PFRDA Bill 2011, allowing 26 per cent foreign investment in the pensions sector, but is shying away from providing assured returns to subscribers. $5 billion The rise in foreign institutional investment ceilings in government and corporate bonds. The Reserve Bank of India will buy back Rs 10,000 crore of government securities. Rs 10,000 The increase in prices of diesel cars, including Swift and SX4, by Maruti Suzuki. Other carmakers are expected to follow suit to make up for the rise in raw material costs. 6 per cent Annualised growth of Japan's GDP in three months ending September 30. The country's economy expanded for the first time in four quarters as exports recovered. When it comes to the health of the Indian banking system, the rating agencies are in disagreement. As soon as Moody's changed its outlook for the sector from stable to negative, depressing the markets, Standard & Poor's, or S&P, said Indian banking regulations were in line with global standards. In its Banking Industry Country Risk Assessments, or BICRA, S&P upgraded India's economic imbalances risk score from Group 6, or 'intermediate risk', to Group 5, or 'low risk'. The common man can smile. Investments in small savings schemes - Public Provident Fund, or PPF, National Savings Certificate and Post Office Savings Scheme - will soon fetch more returns. The government also raised the ceiling on PPF deposits to Rs 1 lakh a year. The Real Estate (Regulation and Development) Bill, likely to be tabled in the winter session of Parliament, beginning November 22, proposes registration of builders before the launch of housing projects, and refund of money in case of a default. If it becomes law, each state will set up a dispute resolution mechanism for developers and buyers. Builders will be put behind bars for violation of norms.